​Every day your child will experience dough disco which is a finger strengthening exercise to promote early writing skills. We have high quality provision with well trained staff that encourages each child with their language and physical development. 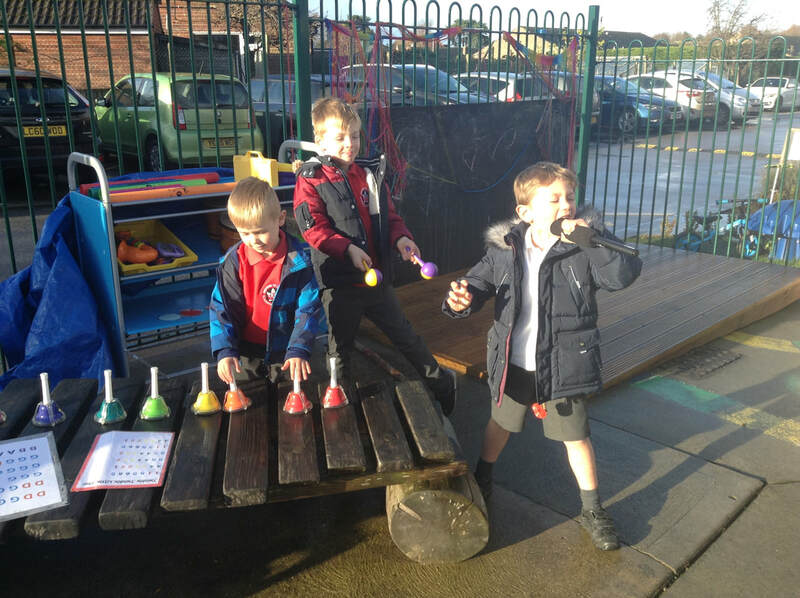 ​We have daily morning activities, targeted continuous provision activities, interventions (daily dough disco) and a weekly Rainbow Challenge that focuses on developing fine motor skills. These are important as they strengthen children’s core, hand, arm, shoulder and finger muscles which allows them to become confident and better writers. Why don’t you try some of these activities at home? Use padlocks and keys – how quickly can your child unlock them? Clothes pegs – how many can your child peg around a box in one minute? How many small beads can (s)he pick up in one minute using tweezers? Mix pasta and dried peas – can your child separate them using tweezers? The children receive Achievosaurs when they are demonstrating the Characteristics of Effective Learning. Explorosaurs are excellent at finding out about things and about the world around them. Askaraptors are very talkative learners. 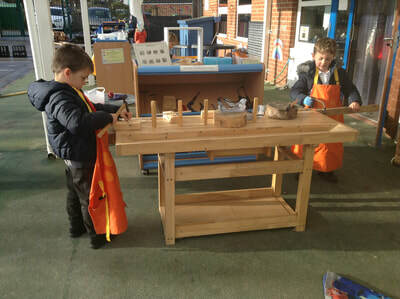 They love to ask lots of questions which develop and deepen their knowledge and understanding. Stickasaurus have bags of perseverance and never give up, even when the going gets tough. They are known for sticking at things. Solveosaurus Rex work really hard to solve problems and find new ways of doing things. Thinkadocus are deep thinkers. They think carefully about what they learn and are able to talk about their thinking and learning. Shareadactyls are known for their kindness and ability to share. Whether it is sharing ideas or resources, they always consider others in their learning. They are great team players. The children enjoy working through a range of challenges each week (phonics, mathematics, creative malleable, funky fingers). The challenges are indicated by a photograph and a coloured lollipop stick. Different challenges are added over the course of the week and the children independently access and complete the challenge. Each time they complete a challenge they find their key worker ipad, their name card and take a photograph. They then select the coloured stick for that challenge and put it in their pot of gold. As a way of promoting democracy we have a weekly vote to decide what the celebration reward will be when they have completed all the challenges! 'I really liked making my own play-dough and making a face, a body and arms!'. Apply (where children read or write words or caption). We follow a two-day programme for new sounds where we focus on reading the sound and words on the first day and writing them on the second day. The order in which we introduce our sounds is linked to handwriting families (e.g. c,o,a,g,d). Children continually apply their phonic knowledge through self-initiated and child initiated activities. The children had a wonderful time at the EYFS Phonic Workshop. Here are a sample of the type of games we play during our phonics lessons. Each game is designed to encourage your children to either read their tricky words by sight, increase their awareness of the letter sounds or say the sounds in a word and blend them together to read the word. Some games also include the reading of 'alien' or pseudo words which again encourages your child to practice saying sounds in a word and blending to read. As you can see we keep the games interactive and fun so they enjoy learning whilst playing. Mastery Maths develops confidence as all children can achieve. Success in maths for every child is possible. It is about making connections which leads to deeper understanding instead of accelerated learning. We teach systematically starting with the number 1, knowing all facts relating to the number. Once deeper understanding is established we continue to the next number. Our provision is set up to allow children to independently apply their maths in a range of real life situations e.g. using real money in shop, using scales to measure when baking, using measuring equipment to measure capacity and length. We use a variety of resources including: Numicon, counters, ten frames and numberblocks. We value the importance of parent partnerships and promote this throughout the year. We hosted our first stay and play session, it was a joy to see the children proudly show their family members their learning environment. Together we made pine cone owlets, peg dolls, Mr Potato heads and butter biscuits. Wow! What a fabulous start to the academic year, the children have amazed us with how positively they have come into school. It has been a busy start for us and the children are already showing signs of becoming inquisitive and independent learners. 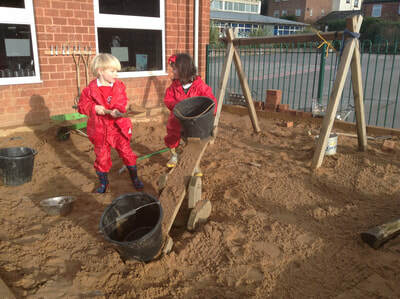 The children have enjoyed exploring their new learning environment and following new routines. So far, the children have been investigating the outdoor sand and water, creating obstacle courses, exploring instruments and putting on show stopping performances on the stage. Furthermore we have been learning how to safely use the tools in our woodwork area and how to use, respect and tidy away all the equipment. We are so proud of how they have all taken on each new challenge with confidence and a beaming smile! We are all very excited about the year ahead and look forward to seeing the children flourish. While many times getting our hands dirty is frowned upon, NWF has some new facts and figures that may have you throwing your kids into the nearest mud puddle. In our latest report, we'll reveal how getting down and dirty in the great outdoors--far from being a bad thing-- helps children lead happier, healthier lives. We enjoyed a fabulous Saturday morning of the fire building and fun with our dads and grandads. The children worked really well together building their fires, using the flint and steel to get a spark and keeping their fires going. The best bit was toasting marshmallows on our fires! There was even some competition from the dads! Here are some ideas to help your child at home. Your child will bring home a reading book and a phonics story book home to share with you. Please help your child to look at, read and discuss the books. Home Learning Tasks: Each week we will send home a small task for you and your child to complete together, this will usually be an activity based around what we are learning about in school and will help to consolidate their learning. Please click here to view the EYFS Phonic presentation from September 2018.